The pattern of drug resistance in serving soldiers who had relapsed after adequate, fully supervised, short course chemotherapy was analysed. Relapse was caused by drug resistant organisms in 39.1% of patients in comparison to 11.6% of drug resistance amongst the fresh cases of pulmonary tuberculosis with culturable bacilli on admission (p<0.05). The other disturbing trend was emergence of rifampicin resistance in 35% (p<0.05) cases of pulmonary tuberculosis relapse. Emergences of rifampicin resistance in these relapse and retreatment cases are matters of great concern In tuberculosis management. Fifty cases of peripheral tubercular lymphadenitis were treated with either of two short course chemotherapy regimens of three months R3(3SHRZ) and five months R5 (3SHRZ/2S2H2Z2) duration. Complete disappearance of lymph node was found in 74% patients of R3 regimen and 92% of R5 regimens. There was no relapse with either of two regimens in 18 months of follow up. The patient compliance was 100% with both the regimens thus both the regimens, were found to be effective though R5 regimens gave better results. A questionnaire on source of information regarding tuberculosis, signs and symptoms, diagnostic methods, treatment duration and personal and community hygiene relating to tuberculosis, was administered to 446 students and employees with an educational status of high school certificate and above. The main source of information were books and magazines and 85% were aware that the Tuberculosis germ was the causative agent. Symptoms of Tuberculosis such as cough (85%) and loss of weight (74%) were well known. Other symptoms such chest pain (29%), fever (27%) were less known. Sputum examination as a diagnostic tool was known to 68% while 80% knew about radiograph being used to diagnose the disease. Cough as a method of spread was known to 91%. In this questionnaire the duration of treatment was the least known fact. 28% felt that treatment could be stopped if symptoms disappeared. 16% were aware that the method of sputum disposal was by incinoration.The implications are discussed. A case of bronchiolealveolar carcinoma, mimicking pulmonary tuberculosis was diagnosed at autopsy. This is reported with relevant literature review. Takayasu's arteritis (TA) or non-specific aortoarteritis is a chronic, idiopathic, inflammatory disease that primarily involves the aorta and its branches, hence also known as the "aortic arch syndrome" or "pulse less disease". The constitutional symptoms in the early stages may mimic tuberculosis. A case of TA who was referred to our department for suspected tuberculosis is reported with review of literature. 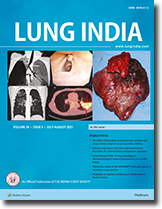 We report a patient who developed lung cancer in association with idiopathic diffuse interstitial lung disease. Such an association is well known though hardly ever reported in Indian literature. We present our experience of a combination chemotherapy in a group of patients with advanced NSCLC. Forty six patients were enrolled in the study. However 20 dropped out after one or two courses of therapy. Therefore data were analysed for the remaining 26 (three females, 23 males, age 32-67years). A combination of Vincristine 1.3mg/m2, Bieomycin30mg/M2 and Cispltin 80mg/m2 with hydration were administered i.v. every four weekly. A single fraction of local radiotherapy(1000 rads) was given to 15 patients in addition. The mean performance status was 87. The overall radiological response was 42%(CR 15.4%, PR 26.9%). The median survival was 18 weeks with 46% of the patients surviving for more than six months, 15% surviving beyond one year and 11.5% surviving for more than three years. The patterns of respiratory diseases seen in patients attending a private clinic is presented and analysed. The present study was caried out to evaluate the effectiveness of an inhaled steroid, Beclomethasone dipropionate (BDP) in the control of nocturnal asthma. Twenty four adult asthmatics with current nocturnal symptoms were included in a randomised, double-blind, placebo controlled, parallel-group study. Group A patients were put on a salbutamol metered dose inhaler, two puffs (2x100Âµg) q.i.d. plus a placebo inhaler, two puffs b.i.d. Group B patients received two puffs of salbutamol inhaler q.i.d. plus boclomethasone dipropionate (BDP) inhaler, two puffs (2x200Âµg) b.i.d. The treatment was continued for two weeks. Daytime symptoms, additional salbutamol inhalations and nocturnal awakenings due to asthma during the treatments were scored. Group B patients had significantly less day time symptoms, additional salbutamol inhalations and nocturnal awakening scores and greater improvement on spirometry. It was concluded that inhaled BDP is effective in not only controlling daytime symptoms and improving lung function but also in controlling nocturnal symptoms of asthma. Fifty stable mild bronchial asthma patients were studied to characterize the airway inflammation using the technique of bronchoalveolar lavage (BAL). 18 normal non-smoking subjects were studied as control subjects. Total inflammatory cells (29.6Â±18.4 x 106 /dl vs 16.0Â±6.6 x 106/dl, p(<0.001), absolute macrophages (24.5Â±15.9 x 106/dl vs 13.3 Â± 5.5 x 106/dl. p<0.001), cosinophils (1.0Â±1.5 x 106 dl vs 0.1Â±0.1 x106/dl, p<0.001) and lymphocytes (3.8Â±4.2 x 106 /dl vs 2.4Â±1.5 x 106/dl, p<0.05) were significantly higher in BAL fluid from patients with bronchial asthma compared to normal control subjects. Abnormally elevated cosinophils (>4%) and lymphocytes (>28%) in BAL fluid were seen in 15(30%)and five (10%)patients respectively. This study demonstrates that chronic lung inflammation characterised by abnormally elevated macrophages, cosinophils and lymphocytes persists even in patients with stable mild bronchial asthma, despite medication with oral beta stimulants or theophylline. Two cases of classical Wegener's granulomatosis presenting with a solitary pulmonary nodule on a chest radiograph are reported. Both the patients had involvement of the respiratory tract (upper and lower), the kidney, and had features of generalised focal necrotizing vasculities, Histopathology substantiated the clinical diagnosis. One patient is on remission at the end of follow up of two years after treatment with prednisolone and cyclophosphamide, while the other was put on treatment with prednisolone and co-trimoxazole (since the patient refused to take cyclophosphamide). He took treatment irregularly and succumbed to massive haemoptysis six months later (abroad).